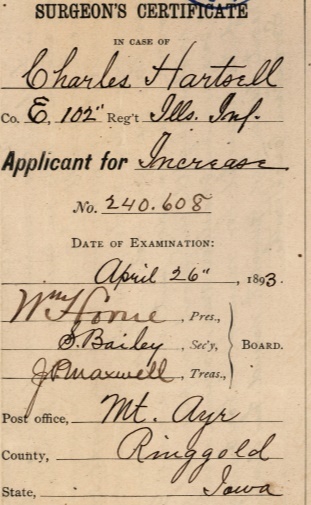 In 1893, Charles Hartsell filed another application for an increase in h is Civil War pension for service in the 102nd Illinois Infantry based upon “heart problems” and wounds he received while in the service. Hartsell has now moved to Shannon City, Iowa. His apparent examination by the surgeons for his pension increase was in Mt. Ayr, in Ringgold County. The fine print needs to be read so that the locations are not confused. Hartsell was living in Union County in in 1886 when he made an earlier request for an increase. Movements are one thing that can sometimes be determined by the seemingly repetitive surgeon’s certificate and affidavits. It may be that one report contains more detail or is easier to read than another. 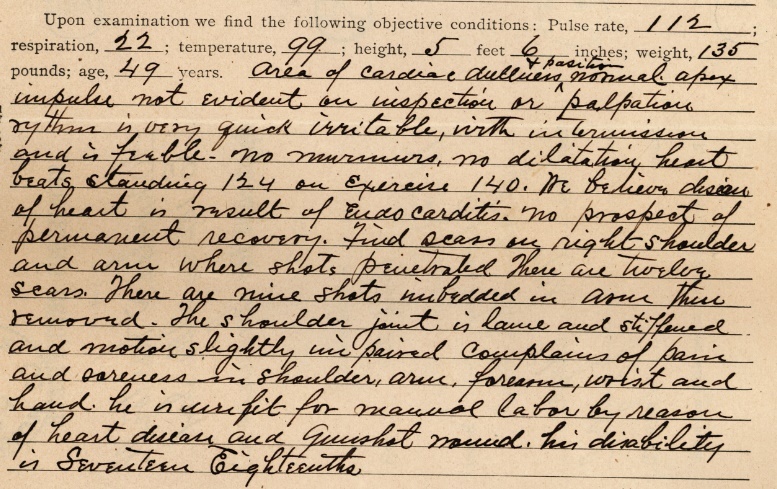 This report discusses Hartsell’s gunshot wounds, difficulty with the arm which was shot, and his heart problems. The forty-nine year old was 5 feet 6 inches tall and weighed 135 pounds. He was determined by 17/18 disabled. This report did not include a diagram indicating where Hartsell had been shot. The original pension file is housed at the National Archives in Washington, DC.